Physicists have often been amazed at the invariance of the speed of light. This means that regardless of whether the source is moving or the destination is moving or even if both are moving, the speed of light remains constant at 3 x 105 km/s approx. What is so unusual about this? Unusual ! It goes absolutely against every practical experience known to mankind! In the normal world things obey what are known as Galilean transformations. Thus take two fast cars 150 Kms apart and travelling towards each other. Car (a) going at 150 kmh and car(b) at 100 kmh. If they both start off at exactly the same time when will they meet ? It might surprise you at first to learn that the time at which they will meet is governed by their combined speed or 100 kmh + 150 kmh = 250 kmh. They will therefore meet after 36 minutes during which time car (a) would have covered 90 Km and car (b) would have covered 60 km. The same would apply if the cars were moving away from each other here, the speed of the two cars is again combined but this time they are moving away from each other, thus they are departing from each other at a relative speed of 100 km + 150 kmh = 250 kmh. If both cars are moving in the same direction then the speed of car (a) relative to the speed of car (b) would be the difference in speed 150 kmh - 100 kmh = 50 kmh. These cars are moving according to Galilean transformations. Imagine then the surprise of scientists when they found that light does not obey these Galilean transformations. Take the following case. Suppose you have a light at a fixed source (A) shining towards a point (B) that is 100,000 Kms. away then we know that since the speed of light is 300,000 km/sec that it should take 0.33 secs for the light to travel from point A to Point B. And this is how long it does take. (note: Actually according to relativity this is by no means certain) Now suppose you fit the light onto a superfast train travelling at 150,000 km/s then surely it should take the light whose combined speed is 300,000 km/s + 150,000 km/s = 450,000 km/s and it should now take the light only 0.222 s to reach point B! Wrong! Say the scientists it would still take the light 0.33 secs to cover the distance from (A) to (B)! How could this be true? More important how could it be proved to be either true or false? I was thinking about this problem when it occurred to me that the speed of sound (because it is a wave) is also invariant. Just like light the speed of sound is also independent of the speed of the source or of the destination or even if both were moving together. How could this be. I was thinking about something else when the answer came to me and it is ridiculously simple. Look at this problem. First you have a stationary sound at (A) travelling towards a point (b) which is 600 m distant. Consider that sound travels at 1257.12 kmh therefore it will take approximately 1.72 secs to cover the distance to (B). Now imagine that the sound (Siren or whatever) is fitted onto a car travelling at 150 kmh , then the sound should now take 600/ (150 kmh + 1257.12) = 1.53 sec to cover the distance to B, right ? Wrong say the physicists the sound will still take 1.72 sec to travel from point A to point B. How could this be ? It becomes very simple to understand when we take into account that the speed of the car depends on its mass, the force with which it can press onto the tarmac, the speed with which the wheel revolves, the force of gravity etc., While the speed of sound is solely dependent on the properties of the medium it is travelling through. The two velocities have nothing to do with each other. It is like comparing apples and oranges you can't do it! So the sound will still take 1.72 secs to travel from point (A) to point (B) while the car would take 14.35 secs to cover the distance from (A) to (B). That's all there is to the invariance of the speed of light or of the speed of sound. Apples and oranges. New Theories / Re: Does F = ma and E = mc^^2 mean F = E? Alan Calverd : It's interesting to be told that we are all wrong, especially by a bloke who doesn't know the difference between velocity and acceleration. "Out of the mouths of babes", perhaps? This is the kind of moronic reiteration namely repeatedly repeating the same mistake and attributing it to someone else that is a result of too much self-absorption. 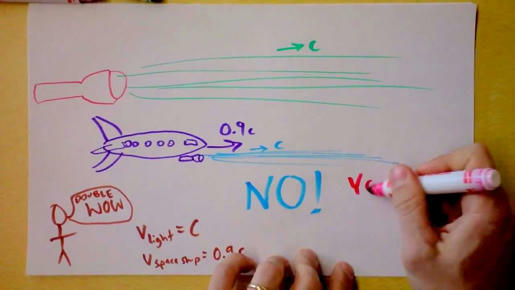 To illustrate here is what I said about acceleration and velocity. McQueen : On the left side, a stands for acceleration, which has units of length divided by time squared. McQueen: E is not equal to force x displacement (as claimed by Alan Calverd nuclear physicist!) , it is W = F x s (Work = force x distance ) and E = Fa : Energy = Force x velocity / time . How did the early theory of the propagation of electricity in a wire formulated by Drude and Lorentz survive for so many years before being replaced by the even more inaccurate quantum version. That said it seems to be pointless to reply to these toothless and inaccurate barbs which I will ignore in the future. Bored Chemist : Common sense is wrong. That is indeed a useful refuge in which to seek safety but in this case it is not just common sense it is everything else that is also wrong the most glaring and obvious of which of which is the maths. alancalverd : No, obviously. Energy is force x distance. Absolutely true, also true is that anything travelling at a constant speed is not accelerating. Was a negative at the start of the sentence necessary ? Chemistry / Re: Can wavelength and frequency of EM waves be changed by the media the encounter? I'm sorry if my reference to virtual photons offends you. Some people take virtual photons very seriously, in the context of light propagating through media. Sorry , my bad, I was out of line to make such a statement. Incidentally I do believe that 'virtual photons' exist and play an indispensable part in the working of the world and the Universe. P.S. On re-reading my post I realise that it is even worse than I had originally thought. Once again my apologies. Please clarify why light waves, ocean waves, gravitational waves and radio waves cannot carry energy. Out of these "waves" only ocean waves are true waves that disperse their energy across the wave front i.e., the energy is shared in common, all of the others ( leaving aside gravitational waves) have discrete energies as demonstrated by Max Planck..
"To make the classical picture quantum, we say that a single photon entering the material will potentially be absorbed and re-emitted by each of the atoms making up the first layer of the material. Since we cannot directly measure which atom did the absorbing, though, we treat the situation mathematically as a superposition of all the possible outcomes, namely, each of the atoms absorbing then re-emitting the photon. Then, when we come to the next layer of the material, we first need to add up all the wave-functions corresponding to all the possible absorptions and re-emissions. Thus, we more or less reproduce the Huygens’s Principle case, and we find that just as in the classical case, the pieces of the photon wave-function corresponding to each of the different emissions will interfere with one another. This interference will be constructive in the forward direction, and destructive in all the other directions. So, the photon will effectively continue on in the direction it was originally headed. Then we repeat the process for the next layer of atoms in the medium, and so forth. It’s important to note that when this picture is valid the probability of being absorbed then re-emitted by any individual atom is pretty tiny– when the light frequency is close to a resonance in the material, you would need to do something very different. (But then, if the light was close to a resonant frequency of the material, it wouldn’t be a transparent material…) while the probability of absorption and re-emission is tiny for any individual atom, though, there are vast numbers of atoms in a typical solid, so the odds are that the photon will be absorbed and re-emitted at some point during the passage through the glass are very good. Thus, on average, the photon will be delayed relative to one that passes through an equal length of vacuum, and that gives us the slowing effect that we see for light moving through glass." Carbon (graphite), with its many connected atoms in many structures has a wide conduction band, and absorbs photons over a very wide range of frequencies. In contrast, glass is a non-conductor, and does not have the same broadening of energy levels in its electron orbitals. The atoms and molecules of pure glass do not have energy levels which absorb and re-emit real photons in the visible range. That's why it is transparent. Stop your gloating, with your derisive reference to 'virtual photons' ! What happens when a quoted source (a) contradicts itself (b) has experimental proof that what the source say can't happen does in fact happen ? Do you apologise or just go ahead with your gloating safe in the belief that the majority view supports you ? "As an extreme example of light "slowing" in matter, two independent teams of physicists claimed to bring light to a "complete standstill" by passing it through a Bose–Einstein condensate of the element rubidium, one team at Harvard University and the Rowland Institute for Science in Cambridge, Mass., and the other at the Harvard–Smithsonian Center for Astrophysics, also in Cambridge. However, the popular description of light being "stopped" in these experiments refers only to light being stored in the excited states of atoms, then re-emitted at an arbitrarily later time, as stimulated by a second laser pulse. During the time it had "stopped," it had ceased to be light. This type of behaviour is generally microscopically true of all transparent media which "slow" the speed of light. " And of course if you consider it from this point of view the idea that light in the form of photons can breeze through a material without interacting in any way with the material and still be slowed down is ridiculous. Further if light is slowed energy is involved, if energy is involved then photons not waves are involved. Because at the level of atomic structure it is all individual interactions, between photons and electrons. There appears to be a misunderstanding here. Light that enters a denser material (eg Flint glass, refractive index 1.61) is slowed down by a factor of 1.61, and it's wavelength is compressed by the same factor of 1.61, while its frequency remains constant. Point taken, energy is conserved in the form of frequency, while wave-length and velocity may change as light enters a medium. That is the wave point of view and it is valid, however, the photon point of view is also valid. Light slows down and the direction of the light undergoes change. The wave explanation of this bending is particularly beautiful since it is attributed to the leading edge of the wave entering the medium first and travelling a shorter distance, followed by the rest of the wave taking a longer route hence the bending or refraction of light. The photon point of view which is that light slows due to emission and absorption claims that when light slows its direction naturally undergoes change. The photon point of view might carry more weight because scientific experiment has shown that the material of the medium contains atoms that contain electrons which can absorb photons of those energies. If the wavelength changes , the frequency changes. The two are inextricably connected. This appears to be true only if the velocity remains constant, it is possible for either frequency or wavelength to change while the other remains constant. In most instances, it is frequency that remains constant while the wavelength undergoes change. The frequency of a sound depends on its source and does not change, the wavelength does. The amount the wavelength is compressed is determined by the index of refraction of the material. By saying that the wavelength is "compressed", I tried to imply that the wavelength is shorter when light is travelling through a material of higher index of refraction. This agrees with the numerical example provided. Sorry to sound contentious BUT if you are speaking in terms of electromagnetic radiation travelling through a medium, then surely if the wave-length is compressed, the light that entered the medium won't be the light that comes out, different wavelength, different frequency. This is the point I was trying to make, namely that light in the form of photons may slow through a medium, due to absorption and emission and THEREFORE the wave-length is compressed without affecting frequency, when the light exits the medium the wave length will also increase due to the change in the speed of light. However, in a wave situation this is not possible. If the wavelength changes , the frequency changes. The two are inextricably connected. As I understand it, the frequency can't be changed, but the wavelength can, when passing through a "linear" transparent optical material like glass, or your eyeball. This is how glasses and your eyeball can focus light. Suppose the speed of light in a vacuum is 3 * 10 8 metres. The frequency of the light is 500 * 10 14 Hz. The frequency remains the same at 500 * 10 14 Hz. Thus the conclusion that the frequency of light remains unchanged while its wave length increases with its passage through a medium is wrong it has to be wrong! On the other hand IF the frequency of the light remains unchanged upon its exit from the medium, it means that the speed of light has slowed due to the process of emission and absorption, without in anyway affecting its frequency or wavelength.